Viro, The Leading Manufacturer Of Environmentally Friendly All-Weather Wicker, Is Introducing Another Highly-Customizable Product, Virofence, Used For Decorative Or Structural Elements. 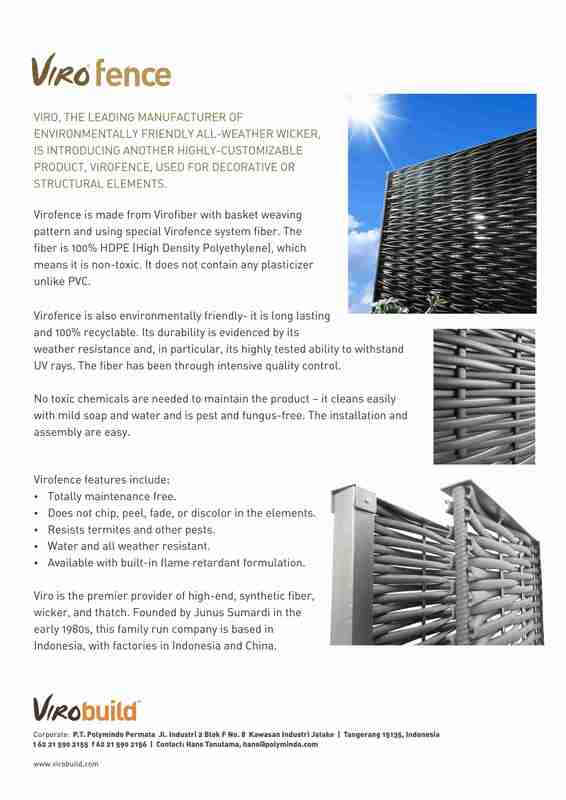 Virofence is made from Virofiber with basket weaving pattern and using special Virofence system fiber. The fiber is 100% HDPE (High Density Polyethylene), which means it is non-toxic. It does not contain any plasticizer unlike PVC. Virofence is also environmentally friendly- it is long lasting and 100% recyclable. Its durability is evidenced by its weather resistance and, in particular, its highly tested ability to withstand UV rays. The fiber has been through intensive quality control. No toxic chemicals are needed to maintain the product – It is easy to clean using mild soap and pest and fungus free. The installation and assembly are easy.